Crawford Art Gallery presents Figure / Abstract, a major exhibition by the internationally celebrated artist Seán Scully. Figure / Abstract is Scully's first ever museum show in Cork and coincides with his seventieth birthday on June 30. 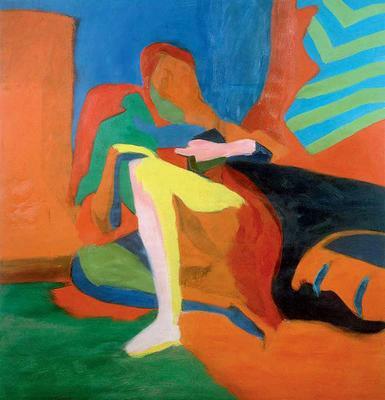 Figure / Abstract will feature works from 1964 to the present, most of which have never been exhibited before. Scully is best known for the epic 'stripe' paintings he has made since the early 1980s: few are aware that he explored figurative painting before turning to abstraction. The exhibition will feature examples of his earliest drawings and paintings, tracing his evolution as an artist through the 1960s and into the 1970s and beyond. The largest work featured is Horizontal Soul (2014), a monumental oil on canvas over eight metres in length. To mark the occasion, and to celebrate Scully’s achievements as an Irish artist on the international stage, the Crawford Gallery will restore the sinead fada over the ‘a’ in the spelling of ‘Seán’ for the duration of Figure / Abstract‘s run in Cork. Curated by Marc O’Sullivan and Tina Darb.